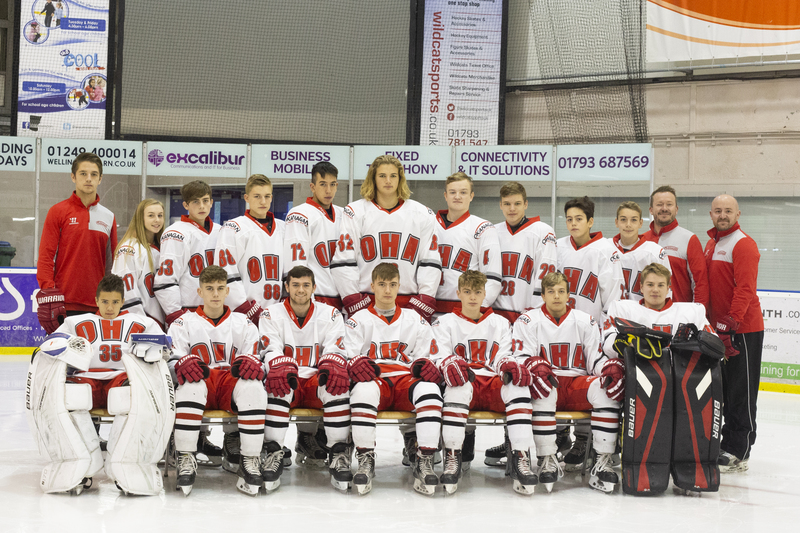 OHA UK continued their recent good form as they beat the visiting Basingstoke Bison U18’s this past Saturday, to help them close the gap at the top of the table to just 3 points now. 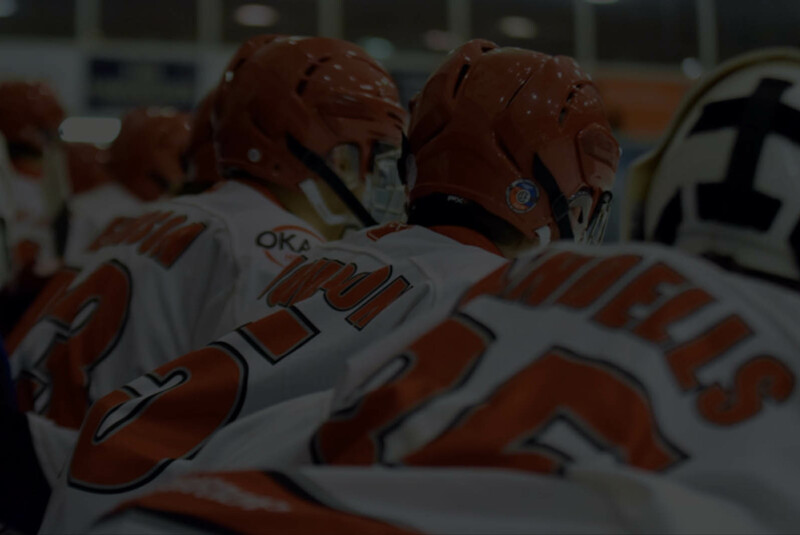 Okanagan started the stronger of the two teams and got off to an early lead inside the first minute. Good work defensively from Sam Taci who then released Aaron Moody breaking through the middle, finishing well with an early shot over the visiting Netminders shoulder. Reed Sayers then doubled OHA’s lead at 2.37 whilst on the Penalty kill. Sayers soon added his second, this time on the Power-Play. A good quick up pass from Joe Llewellyn sent Sayers breaking in from wide, who found space to shoot near side over the netminders shoulder to take the score to an early 3-0 lead. Basingstoke fought back to steady the game after a time-out was called and came out with a refreshed work rate. OHA did manage to find a late goal at 19.24. Again, on the Power-Play, this time Sayers making the pass to Joe Llewellyn at the blue-line who scored with a great shot through a crowd in front. The second period saw OHA score two more to take the game to 6-0. Jack Goodchild and Oli Endicott combing well-created opportunities. First Endicott found Goodchild to take the score to 5-0, before Endicott scored the sixth, this time Goodchild making the decisive pass. The third period saw a strong fightback from Basingstoke. Two goals inside the first eight minutes, brought the score to 6-2 and Max Licht in nets being called into several other stops to keep the lead at four. Reed Sayers calmed the home team down completing his hat-trick and all but settled the game at 50.12. OHA still had time to find a third Power-Play goal of the game. On a 5 v 3 advantage, Sayers set up under the goal line and fed Joe Llewellyn, who notched his second of the game with a great one-timer low past the netminder. Lucas Arto rounded off the Academy’s scoring, cutting through the Neutral zone, before applying a great finish top corner over the netminders glove to take it to 9-2. A late Basingstoke marker taking the final score to 9-3, extending their current win streak to 7 games. 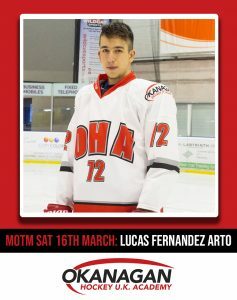 OHA UK will be back in action at the Link Centre this Saturday, March 23rd vs Guildford. Face Off 1pm.